Reflecting Absence includes two pools submerged about 30 feet below street level in the middle of a large open plaza at street level. Street level view of Reflecting Absence. A view of the ramp descending toward a reflective pool of water. 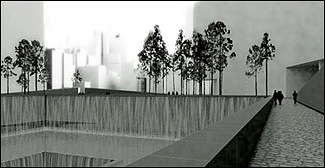 Reflecting Absence, a design that most prominently features two sunken pools where the Twin Towers stood, has been chosen for the memorial at the site of the World Trade Center. The memorial jury made its choice Monday, after a marathon session at Gracie Mansion, and the Lower Manhattan Development Corporation announced the news the next day. The design, which has been on display since the eight finalists were chosen in November, will not necessarily be the one built, since major modifications are expected. As currently designed, visitors would walk through a plaza empty except for a scattering of pine trees at ground level and then descend along a ramp towards the two sunken pools. In another room visitors would light candles in memory of the victims of 9/11. Connected to this room is a chamber where unidentified remains would be buried, accessible only to family members of the victims. 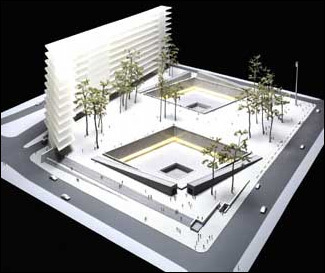 Of the eight designs, Reflecting Absence made the largest alteration to the original site plan for Ground Zero designed by Daniel Libeskind, by radically changing the cultural center into a wall-like structure against its western edge. This design hopes to reduce noise from West Street and create a quieter memorial space, but some have criticized it for cutting off a major entrance to Battery Park City. In a study carried out by Imagine New York, Reflecting Absence ranked fifth of eight in terms of public approval. Sixty-two percent of those surveyed said that the design did not appeal to them. Dual Memory was the most popular, but even that design was disliked by 51 percent of respondents. Summing up the public response, Imagine New York wrote that the aspect of the plan that participants in their study liked the most was the way that the design “respects and highlights the footprints,” and the way it connected the memorial to the past of the World Trade Cener site. 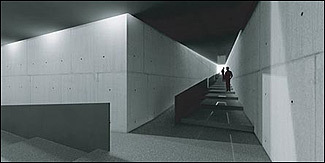 “A number of people commented that they like the designs direct â€use of the void,’ and that the design was simple clean and the â€most memorial-like,’” the report continued. “They found â€Reflecting Absence’ to be respectful, contemplative, peaceful and solemn.” Those surveyed also liked the idea of being able to participate in the design by having a place to leave candles and other artifacts. How Reflecting Absence will be adapted to answer its critics has yet to be seen. The president of the Lower Manhattan Development Corporation claimed that a final design may contain major modifications, after all eight finalist designs received a negative response from both the general public and architectural critics. Some wanted to see artifacts from September 11 integrated into the memorial, others hoped for a combination of elements from several plans. The Lower Manhattan Development Corporation said that Michael Arad and Peter Walker, the designers of Reflecting Absence, have made “significant changes” to the original design. What this means will not be known, however, until the altered design is made public the week of January 12.